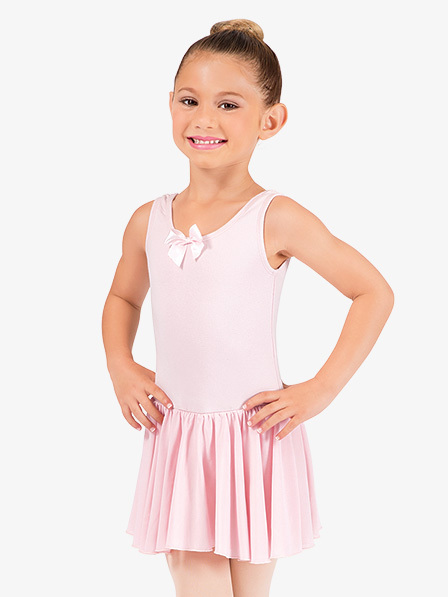 This child tank dress has a classic scoop neckline accented with a satin bow, and a stylish tapered hem. Features a ballet cut leg line on the attached brief and a front bodice lining. Bear with matching dress sold separately. I have purchased many of these dresses for school dance attire and all are great -not one has come apart. They hold their color and shape. Not even a bow has fallen off. I got some of the cap sleeve leos and those bows fell off - but these didn't. The girls tell me they are comfortable too. I picked out this pretty leo dress in light blue for my daughter, 11, whose sizes run from youth small (waist, chest) to youth large (height). We used the size chart and were amazed how well it fit. I haven't washed it yet, but the quality looks good. It seems well made. As soon as we got this home the bow on the front fell off. My 3 year old is average size and the shoulders were too wide and kept slipping off. Some of the threads in the skirt are loose and i see they will come out soon. Spend a little more on a better brand. What is the good size for 5years old? Hi..I liked this a dress but which size should I chose? Xs or S? My daughter is 5 years old. Since 5 year old children range in size, please measure your daughter and reference our size chart for what size will be most appropriate for you. You can find the Theatricals general size chart in the "Sizing" tab, located in the box under the "Add to Cart" button.